Fragrance - Raspberry is far more dominant compared to mint. The smell does remind me of The Body Shop Raspberry body butter – the tart fruity smell that promises a refreshing sensation. 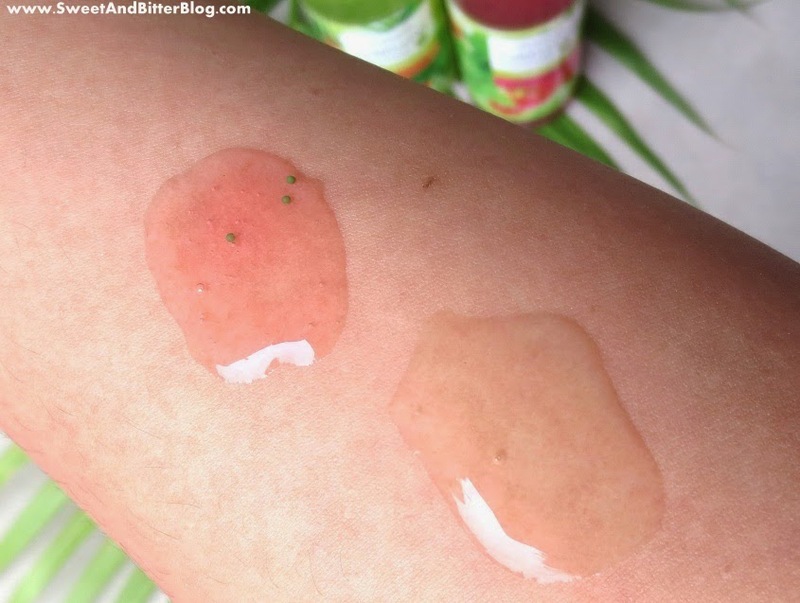 Texture - These contain some green beads and some exfoliating material of the same color as the gel base. The exfoliating material is not as abrasive as walnut shell scrubs. These are quite comparable to those present in Nivea scrub. Experience - This do remind me of the body polishes from The Body Shop. On my first use, the over ambitious me, took a handful of this for my body. Even though I enjoyed using it and the tangy-sweet raspberry fragrance enveloping me felt Oh-So-Heavenly, my skin felt dry later. So I learned my lesson and from the next time I reduced the amount to around two coin size for my full body and tried to work with that using more water. My skin does not feel that dry but not moisturized enough to skip body lotion following its use. This does not lather much and exfoliates quite good. 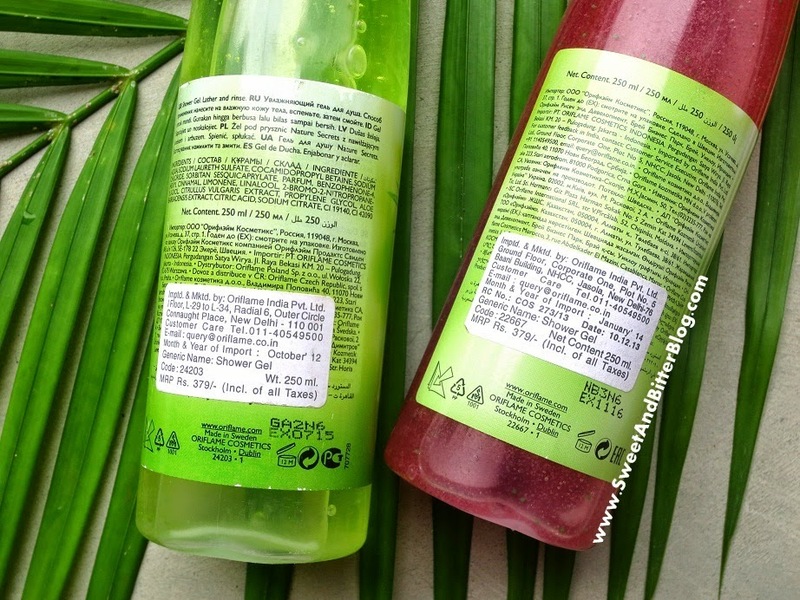 Fragrance - The smell reminds me of The Body Shop Earth Lovers Watermelon & Eucalyptus Shower Gel -maybe because watermelon is the dominant smell in both the shower gels. The aloe smell is almost non-existent in this. Also, The overall smell is very mild. Texture - Thick light green gel. Experience - This does not lather too much, and the lather is soft. I found this surprising because it does contain SLS. The gel is quite thick and quite moisturizing. I have confidently skipped moisturizers after using this. You do enjoy the refreshing smell under the shower, but the smell hardly transfers to my skin. On days, it got transferred; I could smell if for max just half an hour after the shower. So, I am not pleased. I like a shower gel with little more fragrance. Packaging - Sealed bottles with flip tops. BTW, their names are a joke. The second ingredient is dominant than the first ingredient. Then, I looked into the ingredients list which proved my point – the second ingredient is more than the first! So, while purchasing, please keep that in mind. The fruity smells are not run of the mill but something to look forward to. Plus, there are other products in the same range if you wish to layer the smell. See-through bottles with flip tops. The bottles were sealed. 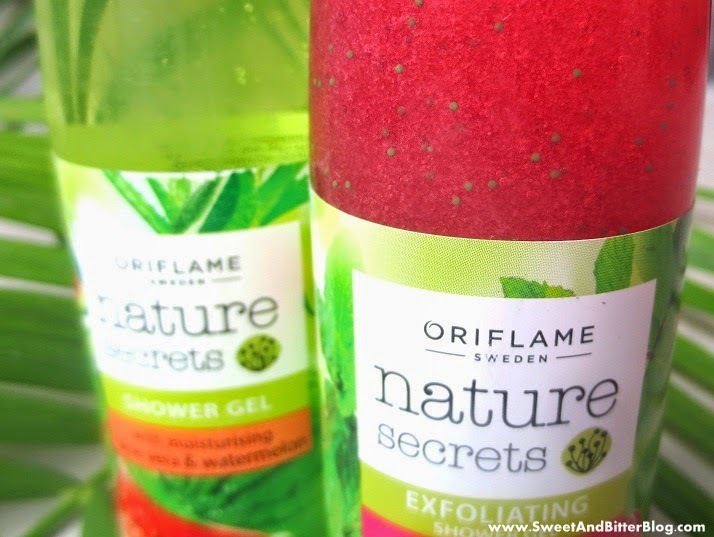 The exfoliating shower gels efficiently exfoliate. The moisturizer shower gel is moisturizing. So, they did what they claimed. Priced quite high at Rs 379 for 250ml. But, do watch out for offers. 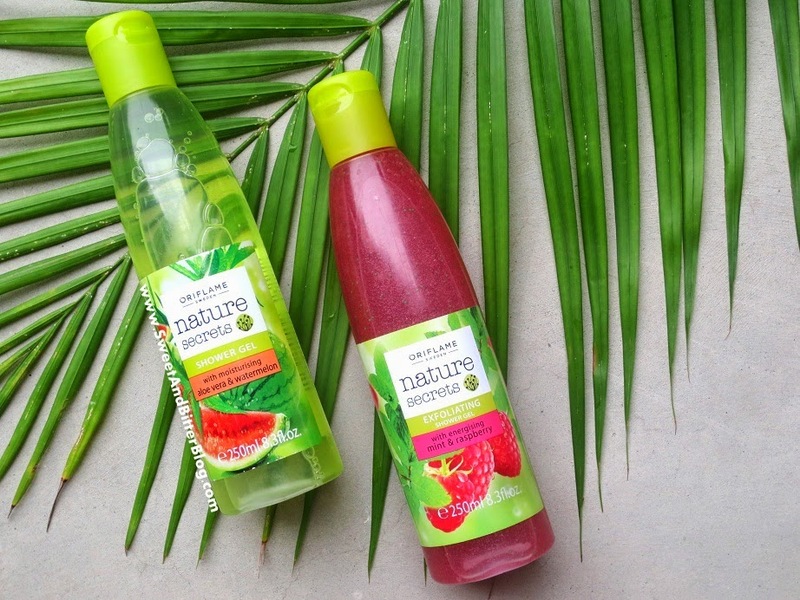 For example, the Aloe Watermelon shower gel is being sold for Rs 319 this month. Overall - I am loving the exfoliating raspberry shower gel now because I am attracted to fresh fruity smells since Monsoon has finally hit my city (Yeah! coz it is not hot anymore...Ohh No coz my skin is oilier, more acne prone and taking pictures has become a task now!). I am confident that I will repurchase the exfoliating shower gels because they are at par with TBS body polishes at a far lower price. I wish they have more variants in exfoliating shower gels. 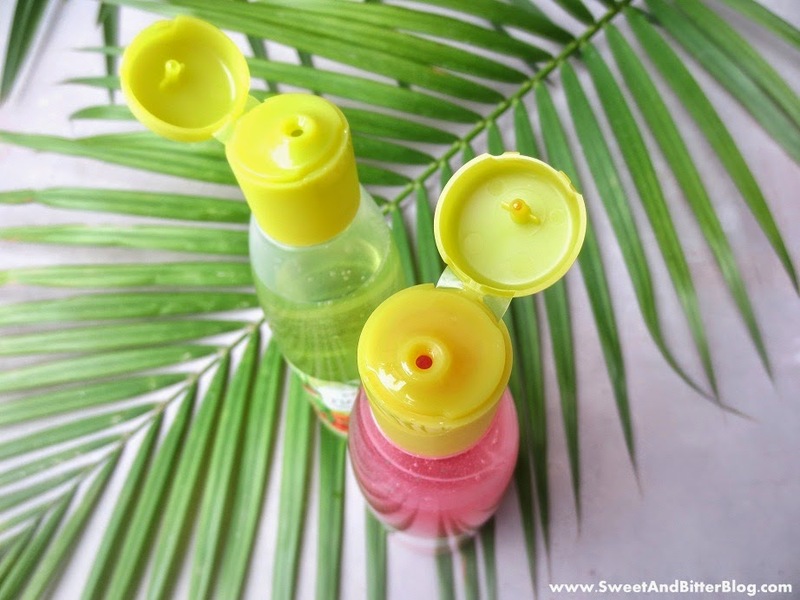 For the aloe watermelon shower gels, I think the price could have been more decent, and the fragrance could have been stronger. 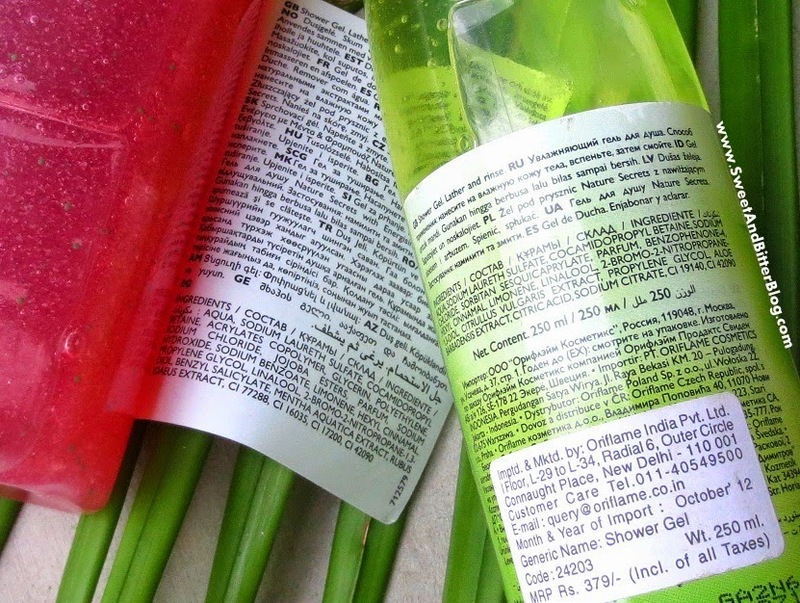 Someone looking for moisturizing fragrance-free shower gels would be happy to use it.